Want to see your windows shining again? Then pick up your phone and call 020 3404 1646 or send us an online inquiry. The customer support is there 24/7. Our expert window cleaners are ready to help you from Monday to Sunday, 08:00 - 18:00. There's no deposit for booking, nor there are any hidden service fees. Call now, you won't regret it! We can clean just about any kind of window, as long as it is reachable. We offer home and office window cleaning. We take care of the cleanliness of many stores and office buildings in the area. We can clean single and double windows, sash windows, skylight windows, garden windows, French doors, small bay and big bay windows, conservatories and conservatory roofs as well, sills – only if they are PVC, frames - only if they are PVC. We can offer sticker removal - upon request. 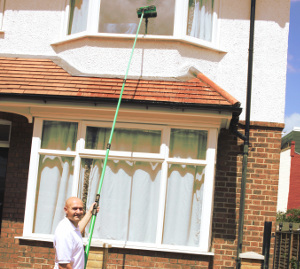 If you want outdoor window cleaning and the windows are with PVC frames and are up to the 4th floor, we can use a modern, fast and highly efficient window cleaning method involving the use of telescopic poles which are fed with purified water and are used to wash the windows without the use of ladders. This method doesn’t intrude in your privacy and also, the purified water is great for washing because it has no sediments and thus leaves no streaks or spots after drying. Plus, it protects the window from accumulating dirt and dust for longer. In case your windows are higher, we have specially trained rope access window cleaners which can wash your windows safely and efficiently for you. The indoor window cleaning is done with squeegees and ladders, plus the most appropriate, safe and efficient window cleaning solution. Don’t hesitate - book our window cleaning services right now! Gutters and downpipes must be maintained clear in order to function properly. Neglected gutters and downpipes can cause drain outlets to dam up, thus filling the gutters and overflow. That will pull them loose eventually causing rust to metal gutters. Cleaning your house’s gutters and downpipes should be scheduled at least twice a year. Keep in mind that it is not a risk-free job - injury can occur from either falling off the ladder or even worst - falling of the roof. Hiring us for a professional gutter cleaning will save you time and trouble. You can book this service in combination with window cleaning. RDA Cleaning & Maintenance Ltd. has a long history of providing the domestic and commercial residents of London with professional window cleaning services of high quality and at affordable prices. All cleaning technicians follow our approved window cleaning checklists and procedures for quality and safety. Our services are fully insured. We have ensured that our cleaners are trained and equipped with the latest professional cleaning technology and the best Prochem certified solutions. They are friendly and wear branded uniforms and have ID badges. We use the most efficient, modern cleaning methods to ensure that you get the best treatment and the best quality service. In order to book our outstanding window cleaning London service, you need to contact our customer support at 020 3404 1646. They are available 24/7 and will process your request within 2 hours. No deposit is required. You will pay once we are done with the cleaning. We are available 365 days of the year, which of course include weekends and bank holidays. Our prices are fixed, so there will be no hidden and unforeseen fees. We accept multiple methods of payment. Regular customers and customers who book early get preferential prices, so do landlords and tenants. If you order more than one of our services at a time, you will get a big discount! Book now!